Keep guideway and bearing surfaces clean of debris and excessive dust. Avoid contaminants with oil, coolant or other fluids. Clean porous media and guide surfaces with 60 psi (0.41 MPa) air pressure applied. Clean using ONLY Isopropanol (Isopropyl Alcohol greater than 90% pure). Do not clean bearings or guide surfaces with ketones. Clean by applying alcohol to a clean, dry cloth and wiping guide surfaces thoroughly. After cleaning allow the alcohol to evaporate completely. Also allow guide surfaces to dry completely before passing bearings over the newly cleansed areas. General-purpose filters are used to remove the bulk of particles before it gets downstream and damages the coalescing filter. 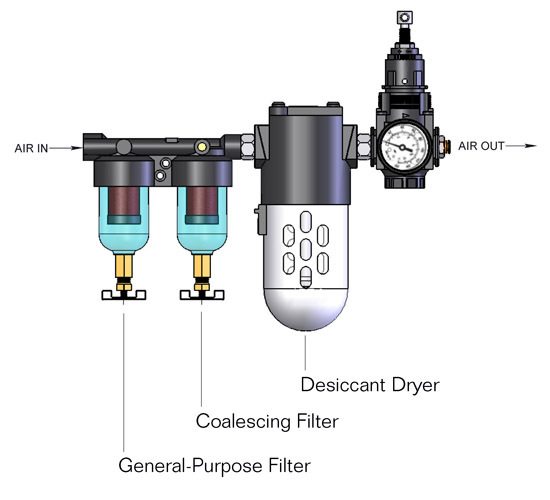 The Coalescing filter is used to remove oil and liquid water, including all the particles that passed through the general-purpose filter. The desiccant dryer is used to remove the water vapor before it condenses.